In this third installment, we hear from Professors Alfred Andrea and James Overfield. Professor Andrea specializes in medieval Europe and global history. Professor Overfield specializes in Global, Renaissance and Reformation and European intellectual history. Andrea, Alfred J., and James H. Overfield, The Human Record: Sources of Global History, 2 vols, 8th ed. (Boston: Cengage, 2014). 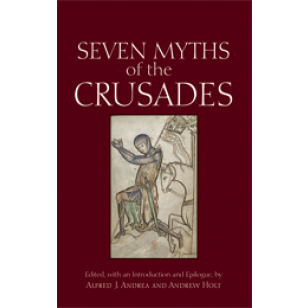 “Seven Myths of the Crusades‘ rebuttal of the persistent and multifarious misconceptions associated with topics including the First Crusade, anti-Judaism and the Crusades, the crusader states, the Children’s Crusade, the Templars and past and present Islamic-Christian relations proves, once and for all, that real history is far more fascinating than conspiracy theories, pseudo-history and myth-mongering. This book is a powerful witness to the dangers of the misappropriation and misinterpretation of the past and the false parallels so often drawn between the crusades and later historical events ranging from nineteenth-century colonialism to the protest movements of the 1960s to the events of 9/11. This volume’s authors have venerable track records in teaching and researching the crusading movement, and anyone curious about the crusades would do well to start here.” –Jessalynn Bird, Dominican University, co-Editor of Crusade and Christendom.